I made these cupcakes as a counterpart to the Chocolate Raspberry Cupcakes for our housewarming/birthday/belated-Boston-wedding reception - I wanted something lighter to serve for those non-chocolate lovers. These were very light - the cake was almost the texture of an angel food cake. However, they had a slightly dry texture. I'd recommend taking them out of the oven when they are *almost* done, to hopefully help keep them moist. However, I'm my own worst critic, at at the end of the night, most were gone. Whisk together cream of coconut, milk, and extracts in a bowl. Beat together butter and sugar in a large bowl with an electric mixer on high speed until fluffy, about 3 minutes. Add whole eggs and egg whites, 1 at a time, beating well after each addition, until combined well. On low speed, beat in flour mixture and cream of coconut mixture alternately in batches, beginning and ending with flour mixture, until just combined (do NOT overbeat). Fill cupcake pans 2/3 to ¾ full. Bake for 18-22 minutes for mini cupcakes. Cupcakes are fairly flat on top. Do NOT overbake - these are on the dry side even when just cooked. 5 1/2 ounces sweetened flaked coconut, toasted, optional for topping. Beat cream cheese in a large bowl with an electric mixer until fluffy. Beat in butter and lime zest until smooth. Slowly beat in confectioners' sugar on low speed until smooth for frosting. Frost as desired. 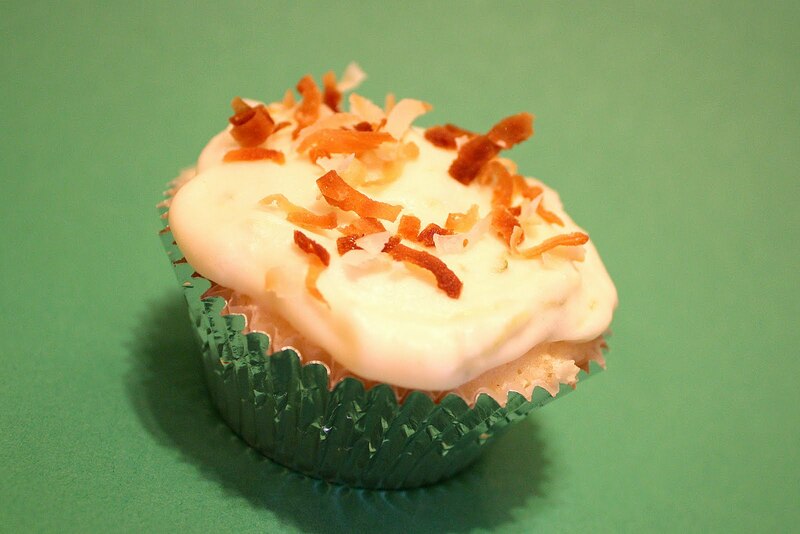 Great when topped with a few strands of toasted coconut!